This area under the hose in the backyard tends to stay sort of damp from the dripping of the hose. This summer that worked in my favor because a bunch of baby ferns popped up. If ever you ask yourself, "Do I have enough ferns in my yard?" the answer is always NO. I threw them in the side yard where I have a lot of lady ferns. I love lady ferns but come July they tend to look like this, especially when your neighbor aggressively trims back her trees along the fence line so your side yard is no longer in shade. They also disappear in the winter, so I want to work more evergreen ferns into this area. I was looking at this list of evergreen ferns for the Pacific NW and I read about the Mexican male fern, which can reach five feet! 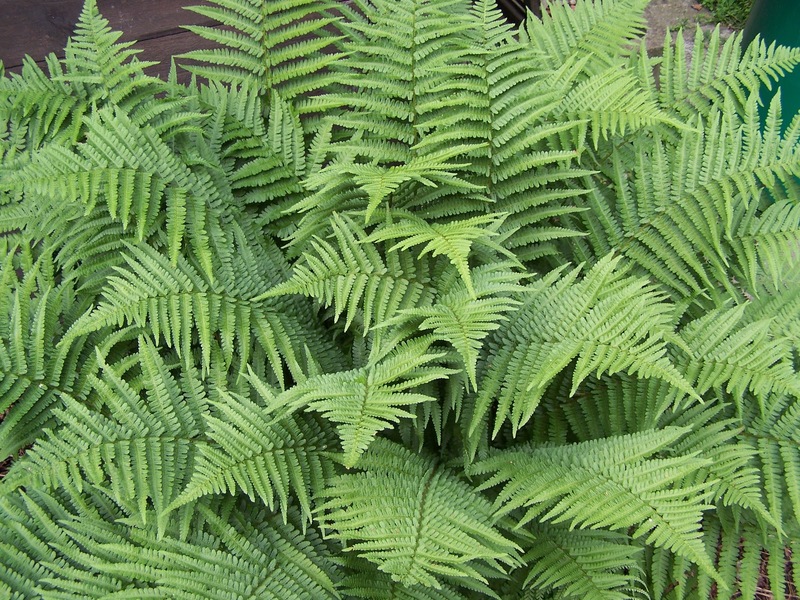 Do I need a five foot fern in my side yard? Um, YES. Alternately I could get a giant chain fern (Woodwardia fimbriata) which is native and gets just as big, but it needs soil that never dries out, so it might fare better in the rain garden in back. I transplanted all of the little ferns from under the hose and gave them a good soaking. I tried to move them in large chunks of two or three ferns, even if they were really close together. I love the way ferns look in the wild, all piled on top of each other. Hopefully it will make this area look less manufactured. I figure by the time these get big enough to be seen without a microscope, the sarcocca I planted should also be big enough to remove some of the lady ferns in this area. In the meantime I put in a tassel fern and an autumn fern. And my most recent Columbia Land Trust plants arrived! I ordered a native, Ceanothus thyrsiflorus, or blueblossom to replace this sad looking mock orange. It's evergreen, a fast grower, and it's loved by pollinators. And come April it should be loaded with blue flowers. Supposedly they don't live much longer than 15 years unless you deprive them of water after the first couple of summers. I can give that a shot. I'd show you a picture but the ceanothus is so small it really doesn't show up. I really do hope it's as fast growing as they say. I planted more Oregon iris (Iris tenax) in front of the crocosmia. I'm hoping this area will fill in with them and then I can get rid of the iron wheelbarrow that I'm officially over. It's too precious, though I am going to give it a shot somewhere else, with sedums. We also weeded and mulched the roses out front. This summer, during the height of my neighbor thinking I wanted her Doug fir removed, her landscaper said he could clean out under the roses and mulch and it would make my neighbor happier, so I said yes (whatever she wants!). His guys cut away more of the lawn in some freakshow pattern and, oops!, ran out out of mulch. So it filled it with weeds. Please tell me, in what universe does this kind of curvature look good? It's like they let a kid with ADHD loose with a sod cutter. Good thing I have a plan for this area and it doesn't involve grass (it does involve a Korean lilac!). I'm also trying to convince Greg that we can fit a Japanese maple here. IT'LL FIT, shut up.